This work presents results from two complementary and interconnected approaches to study water temperature and salinity patterns in an estuarine tidal channel. This channel is one of the four main branches of the Ria de Aveiro, a shallow lagoon located in the Northwest coast of the Iberian Peninsula. Longitudinal and cross-sectional fields of water temperature and salinity were determined by spatial interpolation of field measurements. 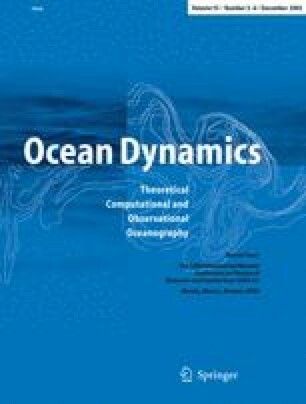 A numerical model (Mohid) was used in a 2D depth-integrated mode in order to compute water temperature and salinity patterns. The main purpose of this work was to determine the horizontal patterns of water temperature and salinity in the study area, evaluating the effects of the main forcing factors. The field results were depth-integrated and compared to numerical model results. These results obtained using extreme tidal and river runoff forcing, are also presented. The field results reveal that, when the river flow is weak, the tidal intrusion is the main forcing mechanism, generating saline and thermal fronts which migrate with the neap/spring tidal cycle. When the river flow increases, the influence of the freshwater extends almost as far as the mouth of the lagoon and vertical stratification is established. Results of numerical modelling reveal that the implemented model reproduces quite well the observed horizontal patterns. The model was also used to study the hydrology of the study area under extreme forcing conditions. When the model is forced with a low river flow (1 m3 s−1) the results confirm that the hydrology is tidally dominated. When the model is forced with a high river flow (1,000 m3 s−1) the hydrology is dominated by freshwater, as would be expected in such an area. The first author of this work has been supported by the University of Aveiro through a PhD grant and by the FACC fund of the Portuguese FCT.